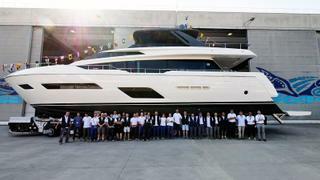 Italian yard Ferretti Group has revealed that the first hull of its new Ferretti 780 range of 24 metre flybridge yachts hit the water in Cattolica on June 22. 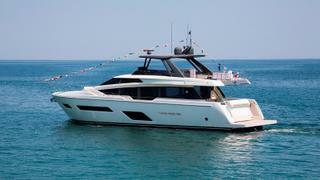 Ferretti Group has placed a particular emphasis on outdoor living with the 780, which features a beach club area in the transom and a vast foredeck seating area, complete with two sofas and a large central sunpad. Triple glass patio doors lead into the main deck saloon, which is fitted with armchairs and a C-shaped sofa. Cutaway bulwarks mean that plenty of natural light can permeate through to this key relaxation area. Further forward, a separate dining area provides seating for all eight guests. All accommodation on board the Ferretti 780 is en suite and below deck, including a full-beam master cabin, complete with walk-in closet and a separate on-board office area. Two doubles and a twin cabin complete the guest accommodation, while the separate crew quarters aft is large enough for a staff of up to three people. Other projects currently under development at the Italian yard include the 26 metre Ferretti 850 series, three of which have already been sold, and the first hull in the Ferretti 920 series, which is due to launch next month ahead of a public debut at the 2017 Cannes Yachting Festival alongside the new 780 yacht.